Classy is the result of our embryo program and we couldn't be happier with how she is growing up! She is a full sister to BL Rio Catchit, the first cow to reach 90" TTT. Classy will be used to build our herd to the next level. 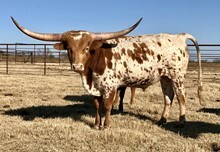 Her dam BL Catchit is a fantastic producer of fertility, milking ability, color, correct conformation and horn. Adding JP Rio Grande to that was an explosive result in horn!